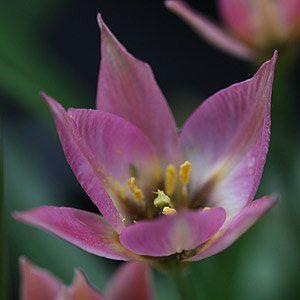 If you are looking for the easiest Tulips to grow, then the species tulips are the ones. You do not have to dig them, the flowers are elegant and the flower reliably year after year. We were first introduced to Species Tulips (Tulipa) by Shirley Tonkin and we now have more of these in the garden than the modern cultivars. Generally they are smaller growing than the hybrids, however they are no less colorful and in our opinion elegant and defiantly easier to grow, as well as hardier than their florist shop relatives. In the Australian climate they thrive, a hot summer is no problem as they are dormant anyway, and as long as the soil is well drained you are pretty much on the way to successful growth. When you see names like Tulipa aucheriana (pictured above right), hageri, kaufmanniana, kolpakowskiana, marjoletti, mauritiana, saxatalis, sylverstris, turkestanica and whittallii you are looking at the plants that have been hybridised to create the modern cultivars. In pots or containers again, good sun and a well drained soil. Add a little lime to the soil and some well rotted compost.